I was looking forward to the break that Easter would bring. Given that we are seeing a distinct upswing in visits to the Passaic Neighborhood Center for Women this year and that we haven't had a true break since Christmas, I was looking forward to the rest, relaxation and extra prayer time that Holy Thursday, Good Friday and Holy Saturday would bring us. However, as we locked the doors of the Center on Wednesday, I was recalled -- that is, I received an official "Recall Notice" for the car I drive. Being overly familiar with past automobile recall notices that had been issued during my almost 40 years of driving, I was prepared to add this notice to a pile of mail and take care of it after Easter. While cursorily skimming the notice, however, my eyes rested on this: "In the event of a crash necessitating deployment of the driver's frontal air bag, the inflator could rupture with metal fragments striking the driver or other occupants resulting in serious injury or death." Following the instructions of the notice, I contacted the dealer, who told me to stop driving the car immediately and informed me that the parts for the repair would not be available until April or May. The dealer offered a free rental car for the duration. Whether it takes two weeks or two months to get the parts, my transportation needs are covered. So, I spent my Holy Thursday morning doing something decidedly different from my previous expectations -- visiting the service department of my car dealer and arranging for a rental car. "It's the beginning of the Paschal Triduum," I said to myself. "Remain prayerful and stay calm. Find God in this." Honestly, I didn't have to do much seeking. As usual, God found me, this time in the person of the service advisor at my car dealer. He calmly explained the reason for the recall, took me through the process and called the rental folks. As I was waiting to be picked up, I encouraged the service advisor to go about his business, as it seemed like a very busy day in his life. But, he chose to sit and talk with me. In the process, I learned about his his wife, grown children and grandchildren and his thoughts about philanthropy -- "If I have what I need, I must share with others rather than buying things I don't need." I learned that he does things like paying off the layaway balances for complete strangers on Christmas Eve and contributing to the Community Health Outreach program of our local hospital. When the rental car gentleman arrived, I was not ready to end the conversation, but I gave the service advisor my business card and went on my way, taking with me the memory of a wonderful encounter with a great service advisor. The whole process lasted about two hours, after which I was in a surprisingly recollected frame of mind. Why? Because on Holy Thursday morning, I experienced a "washing of the feet." Sure, later in the evening, I would have my right foot actually washed in a church by a priest along with 11 other "disciples." But, the unexpected washing of my feet that morning -- by a man whose job title is "service advisor" -- helped me to enter into the preparation for the great and holy feast of the Resurrection better than any other preparation I could have designed for myself. By responding to a "recall notice" on the day when the church recalls in a special way Jesus' service to his disciples and his direction to "do as I have done for you," I was given a shining example of what that means. As one who is usually like Peter, saying "Lord, you will never wash my feet," and one whose days are spent primarily washing the feet of many others, I received a "recall notice" from Jesus, who said to me as he had said to Peter, "Unless I wash you, you will have no inheritance with me." During this Octave of Easter, we at the Passaic Neighborhood Center for Women are very grateful to those who serve us by "washing our feet" through prayers, donations, volunteer service and countless other ways. Through you, we find shining examples of consistently positive responses to the many "recall notices" issued by the Greatest Service Advisor. May God bless you abundantly. 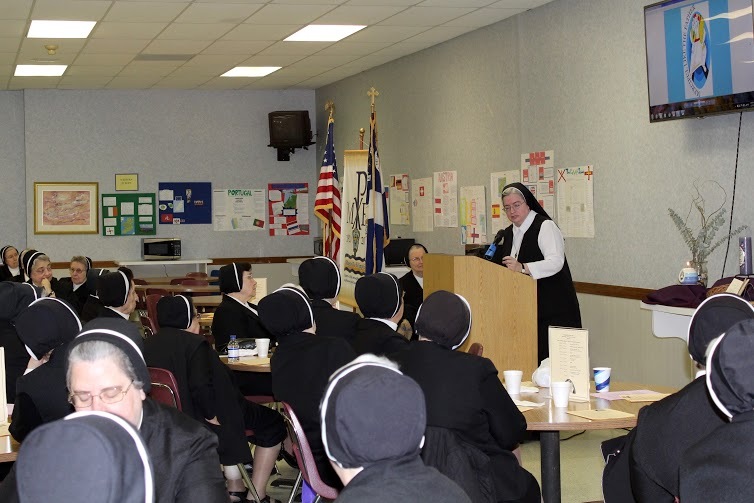 On Saturday, February 27, Sister Ann Marie Paul, SCC, Director of the Passaic Neighborhood Center for Women, addressed the Religious Teachers Filippini at Villa Walsh in Morristown, NJ during their annual Study Day. 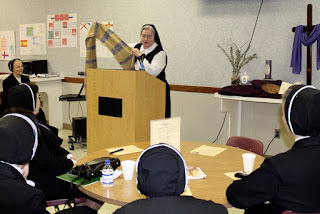 Sister Ascenza Tizzano, MPF, Provincial Superior, invited Sister Ann Marie to address the theme, "Going Toward the Periphery" as it pertains to the collaborative ministry that is the Passaic Neighborhood Center for Women. Having been a member of the subcommittee that worked toward the founding of the Center and now a member of the Center's board, Sister Ascenza is acutely aware of the ministry and its service to those "on the periphery" and she was eager for her Sisters to hear this message. Because the Center is a collaborative effort between the Diocese of Paterson and its religious communities, these presentations to religious communities are key to the ongoing fulfillment of the mission of the Center. We are grateful to Sister Ascenza, her Council and the Religious Teachers Filippini in attendance, who responded so positively to the presentation. crocheted by one of the women at the Center.